« The Selenium Fury gem is ready! Page object factory for Selenium and Ruby. 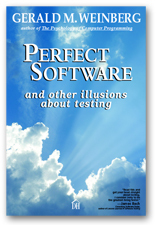 I recently finished reading “Perfect Software and other illusions about testing” by Gerald Weinberg. I wanted to elaborate and reflect on a few points I enjoyed about the book . I recently attended the Software Test Professionals Conference and Gerald Weinberg was there signing his book. I had not heard of him at that point, but now I will be at the front of the line for the next book signing. The first chapter was a home run, it was titled “Why do we bother testing?” I found that this statement shed new light on an old subject for me. Chapter four is titled “Whats the difference between testing and debugging”. I found two interesting answers about locating faults and pinpointing that I was not expecting. I remember thinking at one point in my testing carrer that if I could find a defect and then locate in code the source of the problem that I would be considered an amazing tester. Who should pinpoint failures? Level 0: This issue is blocking other testing. Level 3: The value of our product will be significantly reduced if this issue isn’t resolved. Level 4: This issue will be important only if there are large numbers of similar issues when the product is shipped. From the high level project view, think about your project and how important fixing is. I learned that fixing is linked to an emotional value that is given to every fixable work item. It is possible that every member of the team might assign a different emotional value to ever fixable work item. In this case, how do you manage what gets fixed in what order if all members of your team members have different values assigned to your fixable work items? I like the summary of chapter thirteen to answer this question. In conclusion I highly suggest this book for anyone developing or testing software. It will also be helpful to anyone making decisions about how software is released or built.